Luckily for me I hord sweet ingredients in my freezer like berries, sometimes if I see a great offer on blueberries or blackberries in the shop il buy them and pop them in the freezer for such an occasion. For this recipe you will need. First pre heat your oven to 220'c. Next in a large bowl add your ground almond and oats, sugar then lastly your cold butter. With your fingers rub the butter into the dry ingredients, this will take a few minutes. 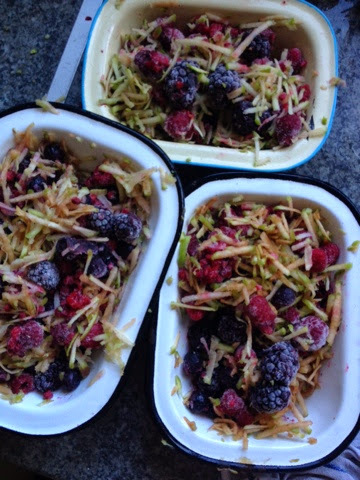 Once your crumble topping is ready put all your berries and grated apple into your oven proof dish I used an enamel dish but something like a pirex dish is perfect. 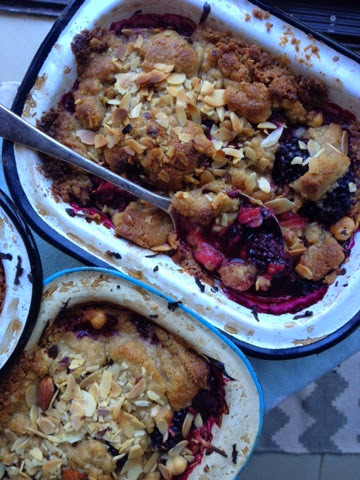 The crumble topping will have the consistsancy of a paste so dollop on the crumble with with your fingers or a spoon. I topped mine off with some flaked almonds and hazelnuts. Bake your berry crumble for 20 minutes at this point the topping should be a golden colour and the juice from the berries should be bubbling through it..